LAP Coordinators with the 2017 Tutors of the Year. From left: Crystal Kiekel (LAP), Mark Manasse (LAP), Helena Almassy, Danny Pittaway (LAP), and Russell Hillabrand. 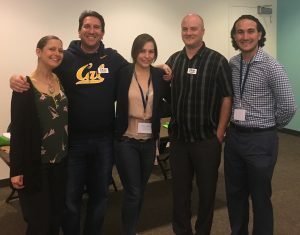 Pasadena, CA–For the first time in its four-year history, Tutor Expo featured an awards ceremony to recognize both tutors and coordinators who had been nominated for excellence in their practice. The nomination form for both Tutor of the Year and Coordinator of the Year were part of the registration materials in the months leading up to the conference at Pasadena City College on March 31 and April 1, 2017. Tutors were allowed to self-nominate and share their stories and experiences about how tutoring has affected their professional growth. 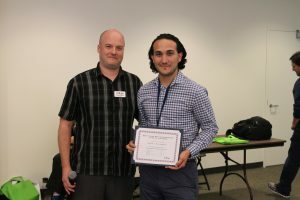 Helena Almassy, a math tutor at San Diego Mesa College, and Russell Hillabrand, a supplemental instruction leader in American government and philosophy from Fullerton College, were each selected as Tutor of the Year. 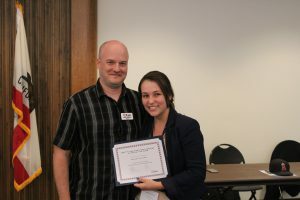 Helena Almassy (right) stands with Danny Pittaway as she receives the award for 2017 Tutor of the Year. Russell Hillabrand (right) stands with Danny Pittaway as he receives the award for 2017 Tutor of the Year. Tutor Expo is the annual conference by and for postsecondary tutors and learning assistance professionals within the California Community Colleges. For more information on Tutor Expo and the Learning Assistance Project, please contact Danny Pittaway (danny@3csn.org. ), Mark Manasse (mark@3csn.org), or Crystal Kiekel (crystal@3csn.org).